The people of the ancient Aztec and Mayan empires revered Chia seeds as a vital nourishment. These mighty seeds, packed with Omega-3, protein, rare antioxidants, and fiber are making a strong comeback in the 21st century. Enjoy them in yogurt, oatmeal, baked goods, or smoothies. The nutritional benefits of Chia include fiber, omega fatty acids, calcium, antioxidants and much more - even protein! Chia seeds have more omega-3 fatty acids than salmon! Chia is one of the most concentrated sources of omega-3 in any food. It also contains high amounts of omega-6. 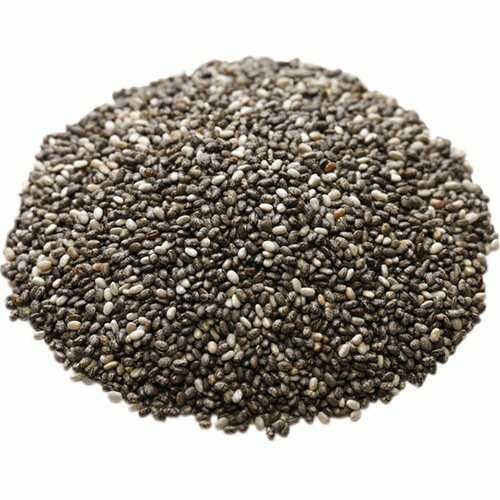 Chia also contains calcium; in fact, it delivers 18% of your daily value per ounce, which is three times more than skim milk. Addition of just an ounce or so of Chia seeds to your diet can reduce caloric intake and help lower the energy density (or calories) of foods; plus, it can double the amount of fiber you receive. Chia has a nutlike flavor. You can mix seeds in water and add lime or lemon juice and sugar to make a drink known in Mexico and Central America as "chia fresca." As with ground flax seeds, you can sprinkle ground or whole chia seeds on cereal, in yogurt or salads, eat them as a snack, or grind them and mix them with flour when making muffins or other baked goods All natural edible sprouts from Chia seeds offer both flavor and nutrients for most dishes throughout the world, and have become a staple for many worldwide diets. They are easy to grow, economical, and 1 pound of sprouting seed can usually generate about 5 pounds worth of sprouts! Ancient Superfood of the Aztecs! Discover the traditional grain of Mesoamerica!